This project provides an important opportunity for history education in Romania. The transition of Romania into developing into a fully and stable democratic society is still in full swing. Existing myths and stereotypes in history and history education play an important role in the images which Romanian people have of their country, their political system, the peoples and countries which are surrounding them and different groups in the population of their own country. This project contributes to the development of history education into a subject which supports democracy, tolerance and participating and responsible citizenship. 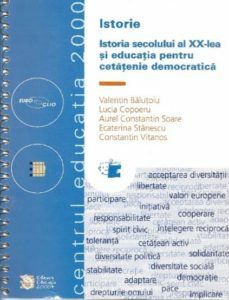 The project tackles the problem of how to enforce history and citizenship education in present-day Romania in order to foster democracy and Europeanism and prepare the young people to become active citizenship in a democratic society. To provide history teachers with materials, tools and skills for citizenship education through history in the classroom. To promote mutual understanding and tolerance, and to combat stereotypes, prejudices and myths. To develop and implement educational material for citizenship education through the learning and teaching of history. To generate a wide group of people able and willing to continue the process of democratisation through history education. Development of a teacher resource pack with innovative educational methodology and historical content focussing on democratic skills and civic society through the learning and teaching of history. Education of an innovative core group of history educators and textbook authors. The use of a wider group of at least 40 history educators including teacher trainers, textbook authors and curriculum developers to pilot and implement the resource book and examples of good practice. Bring together a national network between history educators and others who stress the role of history education in the light of democratic and civic society. Empowering the professionalism of APIR-CLIO. Enhancing the sustainability of APIR-CLIO. Development of APIR-CLIO as a teacher service institute. Setting up a group of pilot schools to pilot and implement the resource book and examples of good practice. Setting up a group of monitors to observe the developments of the project at the schools. 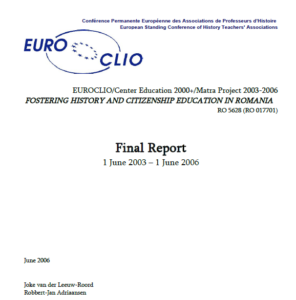 Involvement of international experts on the topic of history and citizenship education from the EUROCLIO network. Involvement of observers from neighbouring countries to discuss the issue of democratisation. Strengthening the international network and acquiring new ideas and approaches by participation of international activities on history teaching. Dissemination of one copy of the resource book to 2500 secondary schools in Romania. 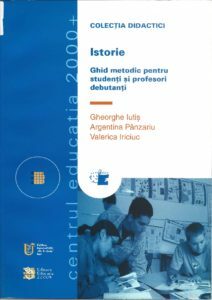 Dissemination and implementation of the resource book among the members of the Romanian History Teacher Association APIR-CLIO, Center Education 2000+, Universities, Pedagogical Universities, Ministry of Education and Research and Research, National Council for Curriculum, National Assessment and Evaluation Service, National Agency for teacher training, pilot schools, etc. Dissemination of the resource book to a wider audience, among others via the media. Strengthen the multimedia centre of pilot schools in order to implement the methods of the resource book. Valentin Balutoiu ,Lucia Copoeru, Aurel Constantin Soare, Constantin Vitanos, Ecaterina Stanescu. Maria Gabriela Dietrich, Mariana Letitia Gavrila, Lacramioara Iordachescu, Daniela Matasaru, Rodica Mihailesc, Ghita Nazare, Nicolae N. Postolache, Igna Claudiu Sular. Monica Dvorski, Eugen Palade, Mihai Manea, Nicoleta Sasu.